Directions: Shake well and spray as needed. 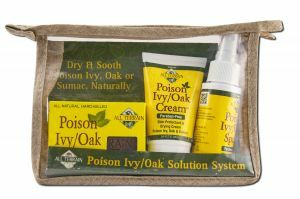 sooth poison ivy, oak and sumac by cleansing, protecting and relieving. When used in combination, these products work extremely well. Soothes itchy and irritated skin caused by poison ivy, oak and sumac. soothe the skin by tightening and maintaining moisture. can be taken anywhere and used anytime because of the re-sealable travel bag included. also to promote environmental conservation. Product made in the U.S.A.